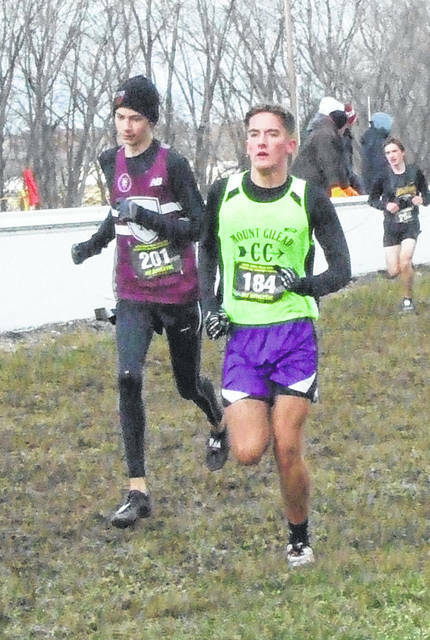 Mount Gilead’s Kyle White (r) played a big role in his team finishing fifth in the state in the Division III boys’ cross country meet. That finish equaled the team’s best-ever performance. Baylee Hack (l) of Mount Gilead and teammate Allison Johnson (r) both earned All-Ohio accolades Saturday at the state cross country meet. Olivia Goodson (l) and Julia Kanagy run for Northmor in the Division III girls’ state cross country race. After being postponed for a week due to flood conditions at Hebron’s National Trail Raceway, the state cross country meet finally was able to take place on Saturday. Mount Gilead’s teams both had successful days, as the boys tied the school’s best-ever performance by placing fifth, while the girls claimed ninth in their race. However, the day could be said to be a bit bittersweet for both squads. The team was led by Liam Dennis, who placed 27th in 17:14.4. Kyle White took 41st in 17:26.3 and Casey White finished 43rd in 17:28.4. Ethan Supplee ran 40th in 17:34, Michael Snopik took 104th in 18:08.2 and Trevor Ball claimed 158th in 19:12.5. While the race was run in cold weather conditions, Casey White noted that those conditions didn’t have much of an effect on him. After the race was over, Hayes said his team had still accomplished a lot. The girls’ team tied Centerburg with 233 points, but the Trojans took eighth and the Indians ninth based on Centerburg having the better-placed sixth runner. The Indians did have a pair of All-Ohio runners. Baylee Hack repeated last year’s fifth place performance by taking the same place in 19:17.6, while Allison Johnson took 13th in 19:47.1. Coming into the race, Hack had hopes of her and Johnson being the top two finishers, but the two couldn’t keep up with the fast pace held by race-winner Miranda Stanhope of Badger, defending champ Emma Watche of Minster and Jenny Seas of Peebles. Hack added that the week wait to run had an effect on her, for reasons both personal and race-related. Also, the weather and the delay played a role, as it led to a bit lower attendance at the meet, as well as the MG teams huddling around a heater in their tent before the race — making the race feel a bit more informal. However, when the her race started, that changed. Hack said that, as the fourth race of the day, the course had degraded a bit from when the boys’ team opened the day. Also for the Indians, Emily Hanft placed 91st in 21:38 and Olivia Millisor was 94th in 21:39.6. Madison Fitzpatrick claimed 148th in 23:01.5, Selia Shipman took 152nd in 23:17.8 and Jadyn Shipman ran 179th in 25:39.4. Also running in the Division III girls’ race was Northmor, who finished 20th on the day. The team was led by Kristie Wright, who was 108th in 21:55.7. Julia Kanagy was 134th in 22:34.1, Olivia Goodson took 139th in 22:39.9 and Sabrina Kelley placed 145th in 22:54.7. Julianna Ditullio finished 150th in 23:06.6, Bailey Snyder was 174th in 25:07.5 and Carolyn McGaulley took 137th in 25:24.6. Cardington’s Mason White closed his sophomore season by running in the DIvision III boys’ race. He finished 64th in 17:42.1.